a long time ago, but of course, I never got around to using it, as is what tends to happen with most impulse buys, right? Anyway, when Sarah from TasteSpotting offered me the opportunity to make a beautiful egg dish, I knew exactly what I wanted to do. There are a few elements involved in making the Perfect Scrambled Eggs. First and foremost, use a pot, not a pan. The steam the develops as the eggs cook help to keep them soft, so you want to trap as much of it as possible in the pot, and stir the eggs often as they cook to keep them from becoming hard. The other key is to add something creamy, but not butter, because butter can make your eggs greasy. 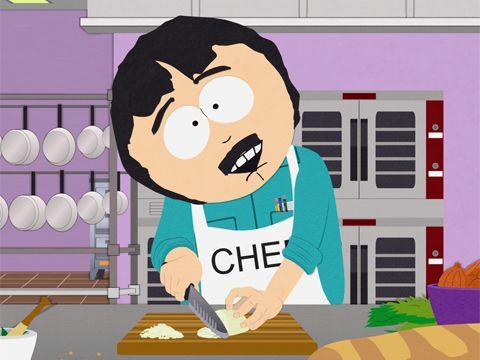 I like, like Randy Marsh, prefer to use crème fraîche, because it’s rich and slightly tangy, so it perfectly balances my scrambled eggs. Those are the two big secrets to making scrambled eggs – once you’ve got those, you just need to cook them over medium heat and stir them often, so that they don’t burn, and ta-da! You’ve got yourself a plate of the most perfect, fluffy, delicious scrambled eggs you’ve ever tasted. Crack all of your eggs (I usually do 2-3 eggs per person). Grease your medium sized pot with a bit of butter, then add in your eggs. Continue to stir with a rubber spatula over medium heat, cooking slowly. Add in about 2 teaspoons of crème fraîche and fold it in, and continue to cook over medium heat until the eggs are the consistency that you prefer. I love a soft scrambled egg, so mine are ready in this photo. Top with some sliced chives and serve alongside some good toast and orange juice. First of all, I used a cutter like this one to cut the tops off of my eggs to remove them from the shell - this way, I was able to wash the shell with warm water and soap and use it as a cute serving vessel. This is obviously an optional step, but it was a great way to showcase how to use pasteurized eggs from Safest Choice and I think that it makes for an impressive plate. If you use this method, just be sure to wash out the inside of the egg shells to remove any leftover raw egg. Whisk together your eggs in a small bowl until well combined. Heat a medium sized pot over medium heat, and melt a teaspoon of butter in the pan to grease it. Add in your eggs and allow to cook a bit, then, using a rubber spatula, stir the eggs every so often to move them around and prevent them from burning to the bottom of the pot. Continue to stir every so often for 5-8 minutes, until the eggs start to firm up. As soon as the eggs show their first sign of firmness, add in your 1 tablespoon of crème fraîche. Fold it in, and continue to stir gently, until your eggs have reached your preferred consistency. I like mine to be quite soft, so I usually take my eggs off the heat after I've folded in the crème fraîche. To get the eggs back into the cleaned eggshell (again, this is completely optional), I used a small spoon and a pair of chopsticks. Sprinkle with some sliced chives, salt, and pepper, and serve. Thanks Joe! Let me know what you think. Thanks for this post. I found it quite interesting. One thing that stuck out for me is the pan vs pot. How does the pot help cook with more steam if covering is limited since you should be stirring frequently? It’s a small difference, but I promise you will notice it! The pan is flat, so the steam leaves immediately, while the pot collects it ever so slightly and allows more moisture to penetrate the eggs. I had decided about ten minutes before I saw this post to make myself scrambled eggs for breakfast (okay, okay brunch). I’m really excited to try out the pot method. That was maybe one of the nerdiest sentences I’ve ever typed. I believe this is the first time I’ve seen artistic-looking scrambled eggs. And I’d never considered using creme fraiche — that’s an intriguing idea! What a cute idea to remove the top of the egg! Thank you so much! We do, too! I love the presentation in the eggshells! I was wondering how you got them cut so perfectly flat, but it seems this egg cutter you purchased does the trick! Soft boiled eggs with toast soldiers for dipping is one of my favorite breakfasts, but this would be a great way to mix things up a bit! I agree – it was definitely fun to plate this dish. It’s been so long since I’ve made legit scrambled eggs! I’ve been on a browned omelet kick for months… but my mom would totally approve of these. She is a fluffy scrambled egg fiend! That is one badass egg cutter — one that I am trying to refrain from buying, knowing that it is definitely going to end up crammed in a drawer, forgotten, until I find a use for it three years from now. And HECK YES for vegan doughnut shops! That’s so awesome, definitely let me know when it’s open so we can do some major taste testing! Oh yay I’ve been making my eggs with a dairy element for years! I think you can really notice the difference, especially if, like me, you prefer soft, ‘just formed’ eggs. Usually I use no-fat milk though, as I feel so guilty using cream. Do you think there would be a huge difference? I think there would definitely be a difference with something full-fat like cream or creme fraiche – everyone needs a treat now and then! My eggs always turn out watery or burnt, and sometimes both! I’ll have to give this a try. Thanks for posting this!!! I hope this recipe helps! Thank you so much, Simone! Your photos are pretty drool-worthy, too! More DEAD FOOD. Why on earth would anyone want Pasteurized Eggs? That is disgusting. When chickens are raised correctly there is no risk of salmonella. Pasteurizing food is just an excuse to be a lazy and dirty farmer.. I have a home-flock of chickens for eggs and raise chickens and turkeys for meat in the warmer months … I eat raw my eggs regularly! Salmonella bacteria is introduced into chicken housing through rodents and filthy conditions! Thank you for your concern, Hayley. I think it’s important that people have all the options that they want available to them – you definitely don’t need to eat these eggs if you don’t want to! However, if you want to err on the side of caution, then Safest Choice Eggs are a great option. I, too, eat raw eggs often in dressings and sauces, but if you can be guaranteed that there is no risk of salmonella or other food borne illnesses, especially if you are pregnant, nursing, or have small children, then why not? They look pretty, but were they hard to eat out of the shells? I’d imagine you’d get lots of little shell fragments everywhere from trying to dig the egg out. Thanks! I served them with a long, thin spoon (like something you’d stir a cocktail with) – you can definitely just put them on a plate, though, if you like. It reminded me of something I made that was also stuffed in egg shells.. I love the name of your site! Scrambled eggs are pretty much all I cold make, since everything I make turns out scrambled eventually. But your post bring scrambled eggs to a much higher level, really awesome! Fantastic photos! We (Randy cooked) tried your method this past weekend and we are complete converts. We didn’t have creme fresh so substituted half fat Philadelphia creme cheese and it worked a treat. Thanks. I’m glad that you guys liked it, and I’m glad that your husband cooks for you! oh my yum! i saw a post like this last week, but it wasn’t scrambled eggs! this is such a great idea. I’m a monster for cheese, so might add some cheese to the scrambled mix! thanks for sharing, such beautiful presentation and stunning photos! I used this method to make scrambled eggs for my boyfriend and I. I used sour cream (in Hilo, there is simply no creme fraiche) and the eggs were amazing. They were so fluffy and light, just great and tasty! P.S. Shout out to crazy Randy Marsh! I’m glad you’re a South Park fan, too!